Refund policy: Refunds will be given 1 week prior to the first day of class. A $25 fee will be deducted from all refunds. Cancellation Policy: All cancellations must be made 1 week prior to the first day of a registered class. For any cancellations made after the 1st day of the scheduled class date, a $25 fee will be deducted from the refund. In the event that Fruiggie cancels a registered class, you will be notified as soon as possible and refunded the full amount. No make-up classes will be offered due to the nature of our small class sizes. Althea had a lovely time in your class last week. She proudly showed me her work from the class and said " I paint" :). Thank you again for the class today at Lark. Miranda and Lydia love their purses and carried them around all day. 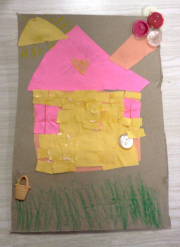 It was such a creative idea and you are a enthusiastic and patient teacher. I hope we can take more classes soon! Join us for 6 weeks of Fruiggie fun! Our Fruiggie kids will engage in art projects that encourages environmental awareness and being health conscious, while having a fruiggietastic time! Students will explore different techniques using recycled materials and organic non-toxic art supplies. Art projects include, natural play-dough making, fruit/veggie stamping, food art faces, shoe box garden, paper making and eco-musical instruments! Students will enjoy activities such as creating their own paintbrushes using recycled materials and things in nature (twigs, leaves, pine cone etc.) 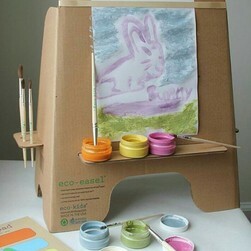 and painting on their recycled easels. Every week will be a new exploration! Engaging in our "Little Earthy Artists" class will help to strengthen your child's creative, fine motor, social skills, and sensory development. Every Fruiggie Kid will be encouraged to be eco-creative, while having eco-fun during eco-play! *All Fruiggie art supplies such as our paints, glue, crayons and play-dough (using vegan food coloring) are non-toxic, vegan, gluten free, fruit, vegetable and plant based. *All Fruiggie paints are compostable. In this story time and art class, we will read a picture story book every week exploring different worldly cultures, sustainability, eco-friendliness, eating healthy and art. Fruiggiekids will then engage in an art project inspired by the book of the day, using a variety of techniques, kid size easels, fruits and vegetables, all natural materials, non-toxic paint, natural glue and crayons, and more unconventional materials. Parents and care-givers will also be included in the fun! *All Fruiggie art supplies such as our paints, glue and crayons are non-toxic, vegan, gluten free, fruit, vegetable and plant based. *Experimenting with Fruiggie Painting will help to strengthen your child's creative, fine motor and social skills, and stimulate your child's senses (Touch/feel, sight, smell, taste). 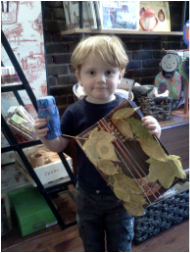 Join us as we introduce our *NEW* fun and educational "Kids Up-cycling Class"! Students will not only have fun designing, constructing, and painting, but they will also learn the importance of reducing, reusing, and recycling, and fun ways to Up-cycle in the process. Students will also learn how they can be an active participant in creating a healthier safer environment. During this 4 week session, students will use various recycled materials to turn their trash into treasures, such as picture frames, wallets, doll houses (made from milk cartons, boats (made from box drink cartons), and much more!! Every week we will work on a fun new project! *All Fruiggie paints are non-toxic, vegan, gluten free, fruit, vegetable and plant based. It’s time for some spring cleaning and re-decorating for the new season! But, why should grownups have all the fun decorating the home! Join us for our NEW Kids Home Décor class!! It’s time for the kiddies to reclaim their space, well their room, and bring out the awesome interior decorators in them! During this 4 week session, students will use recycled materials to design and create their own bedroom decor and home decor items. 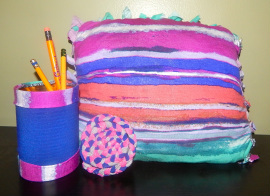 Students will make items such as decorative bed pillows, rugs, coasters, and much more! Students are encouraged to bring their own used unwanted clothing (t-shirts and/or jeans). What better way for your kiddies to re-design their space, with the environment in mind. *All Fruiggie paints are non-toxic, vegan, gluten free, fruit, vegetable and plant based. All Fruiggie paints are compostable.